Tia Harris (TH): Music has been in my life since I was born. Both of my parents are singers in church and when my mother first moved to Columbus, she was a jazz singer here on the local scene. She then decided to focus on music in church, being a vocalist and a choir director. Music has always been instilled in me and is my passion. TH: I love and listen to a lot of artists. Al Jarreau, Stevie Wonder, George Duke, Patty Austin, Anita Baker, Natalie Cole, Patty Labelle, Sade, Earth Wind & Fire, Elis Regina, Eliane Elias, Chaka Khan, Basia, Gabriela Anders, Maysa, Incognito, Kevyn Lettau, Manhattan Transfer, Michael Jackson, Minnie Riperton, Nancy Wilson, Ella Fitzgerald, Sarah Vaughan, Shirley Horn, Phoebe Snow, Quincy Jones, Yolanda Adams, The Clark Sisters, Take 6, shall I go on? I can truly say I’ve always idolized all the trailblazers such as Ella Fitzgerald, Sarah Vaughan, Billie Holiday and more, but I cannot get enough music so narrowing it down is very difficult for me. TH: My fondest memory would have to be when Ray Eubanks, who was the founder and conductor of the Jazz Arts Group, decided to take me with his band to Spain and Germany to do some touring. I was the featured vocalist with the band, and we performed to such welcoming audiences everywhere we went. It was so good to see and feel the appreciation of what we did in another country. Actually, whenever and where ever that happens, it’s always an overwhelming feeling for an artist. But my fondest musical memory would have to be being appreciated by another country and culture. TH: I listen to all many types of music all the time. I sing with a jazz/Brazilian band right now by the name of Canta Brasil. I am listening to a lot of Brazilian music, as well as a lot of gospel, and music that is dealing with heavy vocal harmony such as Take 6, New York Voices, etc. I’m also listening to a lot of Big Band material which I dearly love and often sing with the Rick Brunetto Big Band at the 94th Aero Squadron, every 3 Thursdays. TH: Columbus has so many extremely talented musicians here. If you have a musical plan and are looking to get it done, I believe there is a musician or artist that can fulfill whatever that need is. There are so many wonderful artists and so much talent here that you should be able to also go hear music all the time with choices. Recently the jazz scene appears to be getting better with many establishments starting to utilize the great talent that is here. My hope is that it will continue to get better and grow because the talent is definitely here. TH: I have been working on a CD project for several years now that is compiled with 14 original songs that I either wrote myself or collaborated on with local musicians. The CD was released May 2015 and I am now working heavily on the marketing and promotion of this music. All of this music is very dear to my heart and finally I just wanted to share with others a little piece of me. 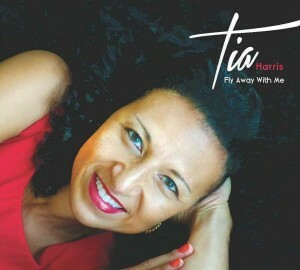 The CD is entitled Fly Away With Me, and you can order it on my website at www.justtia.com.